The Periyar Tiger Reserve, named after the Periyar river, is one of Kerala's prestigious possessions on the High Ranges of the Western Ghats. Falling in the Idukki district of Kerala, this forest Reserve surrounds the Periyar Lake, which was created in 1895 by building a dam across the Periyar river (to divert the water to Tamil Nadu for irrigation). The forests around the lake were declared as Reserved Forests in 1899. The Maharaja of Travancore, realising the significance of conservation, appointed Mr. S.C.H. Robinson as the First Game Warden. Based on his recommendations the forests around the lake were turned into a sanctuary in 1934 and christened Nellikkampetty sanctuary. The sanctuary which was a game reserve merged with the Forest Department in 1966. 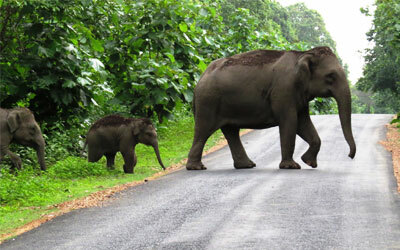 It was declared a Tiger Reserve in 1978 under the Project Tiger scheme. In 1982 the core area of the reserve (350 sq. km.) was notified as National Park. The Reserve covers hills and verdant forests extending over an area of 777 sq. km. 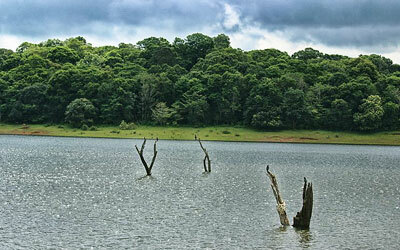 The Periyar lake, the nucleus of the sanctuary is about 26 sq. km. in extent. The elevation ranges varies from 900 M to 2019 M.
The forests of Periyar can be divided into four categories. The open grasslands are home to the Elephants, the Bison and herds of deer. The moist deciduous forest is dominated by trees like Terminalia and Teak which shed their leaves seasonally. The semi-evergreen forest occurs along wet stream areas and is often adjacent to the tropical evergreen forest. Lastly, the 'Sholas' or tropical evergreen jungle which is typical of the entire western Ghats in the state, abounds in this Reserve . The varied habitat in the sanctuary supports a number of species of terrestrial, aquatic and arboreal animals. Apart from Elephants, other herbivores in the Reserve are Gaur, Sambar deer, Barking deer, Mouse deer, Nilgiri langur, Bonnet macaque, Lion-tailed macaque etc Tiger, Leopard, Jungle cat, Wild dog, etc are the major carnivores seen in the area. Other important animals are Bear, Porcupine, Jackal, Indian Giant Squirrel, Malabar flying squirrel, Wild boar, small Indian Civet, Mongoose and the Pangoline. The tiger is the main attraction in the Periyar Tiger Reserve. An estimated 40 of these magnificent beasts inhabit the Reserve. 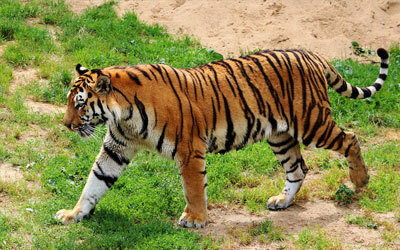 The Indian tiger is a large animal averaging a little less than 3m. in length. This great cat is a solitary animal except when courting or when a tigress is with her cubs. The cubs only leave their mother after reaching maturity at the age of about 2 years. Tigers hunt the large herbivores including sambar and other deer, gaur, wild boar, etc. The tiger's beauty and strength are beyond compare. No one can ever forget the first sighting of this great cat in the wild . Even a brief glance is an unforgettable experience. But it is a shy and alert animal, hence difficult to see and observe at ease. Elephants live in herds with a leader which is often an old and experienced cow. A herd also has a master bull which dominates other bulls. Not all bull elephants have tusks and those without are called makhnas. Cow elephants in India, unlike in Africa, do not have tusks. This enormous animal is the largest of the land mammals. It requires ten to fifteen hours of grazing everyday. It feeds on grass, tree barks and so on. The elephant is a very intelligent animal, has a highly developed sense of smell and hearing but its young are sometimes attacked by tigers, but this is very rare as the herd defends its young extremely efficiently and even ferociously. Man, of course, has hunted this great animal for ivory for hundreds of years, but today the elephant, found in many forests in India, is a protected animal. 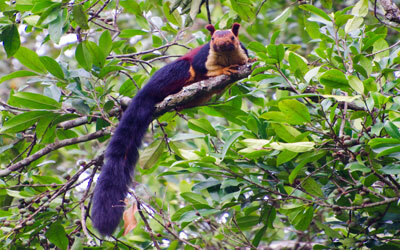 The beautiful Indian Giant Squirrel, also known as the Malabar squirrel is a common sight in the Periyar Wildlife Sanctuary at Thekkady. This species of squirrel is large sized when compared to the tree squirrel. They are usually found in the forests of Peninsular India. They are vibrantly coloured and have a nearly 2 feet long tail, making this squirrel a delight to watch. 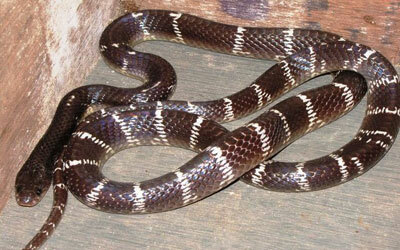 But this species have now been listed as endangered and near threatened in the IUCN Red list. 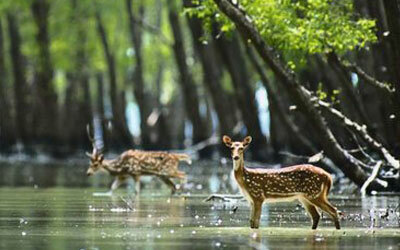 Deer of some sort is usually found in abundance particularly the Spotted Deer and the Sambar Deer. 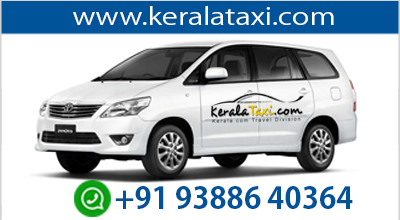 The spotted deer is the usual deer species that is found in India and is called Chital or Cheetal. They are moderately sized deers with white spots on their body. It is the male spotted deers that have antlers. The Sambar Deers are also widely found in India. They are listed as vulnerable species in the IUCN Red List. It is also sometimes referred to as Philippine Sambar. The Wild Pig, also known as the Wild Boar, is an opportunistic feeder and is found in large numbers across the Periyar Tiger Reserve in Thekkady. They are mostly found in the areas of Eurasia, North Africa and the Greater Sunda Islands. 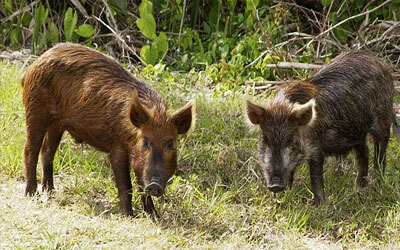 Wolves and Tigers are the main predators of the Wild Pig. Earlier these species were under the list of endangered species but now due to the rapid increase in its number it has been taken off this list. Periyar Tiger Reserve is rich in Bird life. Birds such as Malabar Hornbill, Grey heron, Jungle fowl and Jungle Mynah live in the sanctuary. 266 species of birds are positively recorded. Among the common aquatic birds are Darter or snake bird and Cormorant. While swimming the snake-like neck and beak remain above water. Fish is the main food. Dabchick or little grebe, squat and tailless duck is the Local migrant and is the smallest swimming bird of the locality. This expert diver feeds on aquatic insects and tadpoles. White necked stork, feeds during the day and roosts on trees at the night. During October-May, the bird population explodes in Periyar. Lesser Pied King fisher is another common bird in the lake catching fish that could be hunted from the water. Also takes tadpoles and aquatic insects. Nests in horizontal tunnels, dug on the bank of river, ending in an egg chamber. 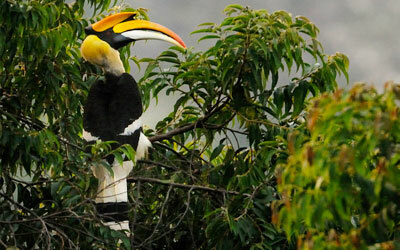 Great Indian Hornbill is seen in evergreen areas. The largest population in western Ghat is at Periyar and is noisy and distinctive in flight. They nest on the natural hole of tree, where the female sits almost closing the hole and lays the eggs and remains there till incubation is over. Male bird collects food and supplies to female and the young ones till they are able to fly. The Woodpecker is the resident of the deciduous forest. Food is mainly black ants. Nests in holes excavated on trees. Brahminy Kite is seen singly or in pairs. Breeds in the area. Feeds on offal, fish, frog and small snakes. Poisonous snakes like Cobras, Vipers, Kraits, and a number of non poisonous snakes forms the reptilian life of the Periyar Reserve. Monitor lizards are also frequently sighted in the forests. Pythons are regularly seen while trekking and in the evergreen areas the King cobra is sighted.